Here you can see the Riedell boots available through The Skater’s Edge. All of these boots are heat-moldable and available in a variety of size combinations. To be sure you have the best skate for your personal skating experience, and to be sure you get the correct fit, please schedule a fitting appointment with us and we will be happy to help you find your perfect skate! 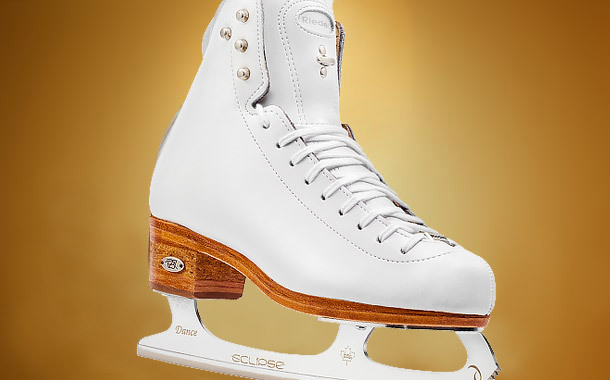 The Skater’s Edge proudly awaits the arrival of Elara and Vega boots from Riedell! Aria is the most advanced, lightweight boot in Riedell’s lineup. 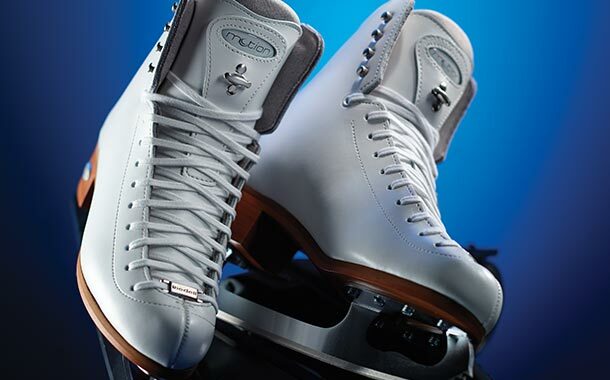 The design of the sole keeps you closer to the ice, increasing sensitivity and edge control. The leather lining is specially treated to resist bacteria and help wick away moisture to keep your foot comfortable. Support: 100 - Aria is ready for advanced double, triple, and quad jumps. Boy’s and Men’s models also available! Silver Star is made for strength and comfort. It has double reinforced TriFusion for ankle support competitors need. The leather sole has cork heels to keep the skate as light as possible. To finish the fit, the forefoot padding and quilted tongue offers improved comfort. Support: 90 - Silver Star is ready for double and triple jumps. The Bronze Star is the durable key to landing doubles. The ankle support you need and the leather sole you trust keeps feet feeling secure. Suede microfiber linings provide a beautiful bronze look and an awesome feel. Support: 80 - Bronze Star is ready for single and double jumps. The Fusion is a lightweight low-cut option for freestylists and dancers alike. Qualities like the quilted tongue padding, low profile cushioned backstay collar, and perforated microfiber lining provide a comfortable fit. Support: 90 - Fusion is ready for double and triple jumps. Like the Fusion, the Flair is a lightweight low-cut option with more moderate support that will serve both freestylists and ice dancers. It also features the low back with extra cushioning for Achilles tendon protection and superior range of motion. Support: 70 - Flair is ready for single and double jumps. Motion has the traditional hand-rolled collar and flex notch eyelet skaters need to keep moving. 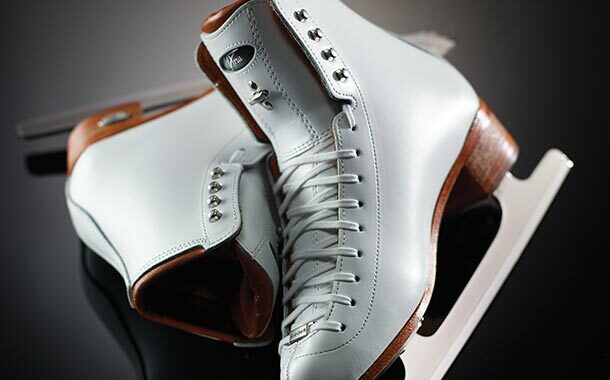 This strong all-leather skate also has a Soft Dri-Lex® lining for easy care comfort and a great fit. Support: 70 - Motion is ready for single and double jumps. For skaters starting to hit their stride, the Stride skate is a great choice to develop skills through single jumps and into Axels. This boot is all-leather and made in USA! Riedell’s Instructor Boot was specially designed with coaches in mind. You choose the support to give your boots life, and they give you the gift of warmth with 3M™ Thinsulate™ keeping your foot insulated for those hours of standing on the ice. This boot also features Riedell’s forefoot cutout relief on both the pinky and ball joint area of the boot for maximum comfort. Support: 70/90 - you choose! Designed for the best of all fields: dance, freestyle, and moves in the field, the Synchro boot is ready for action. The synchro boot’s cushioned synchro-cut backstay provides the most ankle range of motion without sacrificing a secure heel position. The craftsmen at Riedell created a higher heel and tapered midsole to position the foot forward for balance and agility. Combine that with Riedell’s leather/cork heel for lightness and impact absorption and this boot will take your team performance to new heights! Riedell’s Dance boot is low-cut, providing the most range of motion without sacrificing a secure heel position. The craftsmen at Riedell created a higher heel and tapered midsole to position the foot forward for balance and agility. Combine that with Riedell’s leather/cork heel for lightness and impact absorption and this boot will take your ice dance to new heights! Support: 90 - very firm for junior/senior level dances. Riedell also offers custom boot options to skaters with special considerations for their best possible fit, or wildest boot design dreams. We are happy to help with custom orders and to take you through your options during your fitting appointment. Please specify that you are interested in a custom boot order when you schedule your fitting. Please plan for a wait of around 6-8 weeks for delivery of custom boots.